The New Trinity: Has Harley Quinn Displaced Wonder Woman as DC’s Leading Lady? It’s a term that evokes a bevy of visuals. You could be thinking the whole Father, Son and the Holy Spirit angle, or maybe you’re envisioning Carrie-Anne Moss firing pistols in a black leather catsuit. If you’re a DC Comics fan, odds are the three heroes at the head of their universe – Batman, Superman and Wonder Woman – come to mind. It was a pet name for that trio before it became official with 2003’s Batman/Superman/Wonder Woman: Trinity mini-series by Matt Wagner. By the time Kurt Busiek, Mark Bagley, Fabien Nicieza and others completed their run on the 2008-2009 Trinity weekly series, it was locked in. It happened in part because it was an easy term to lean into. Readers knew those three heroes were at the top of the DC Comics food chain. Having a name to represent them made it even easier. However, we may be in the midst of a changing of the guard. While Gal Gadot’s set to debut as Wonder Woman in Batman v Superman: Dawn of Justice on March 25th before her solo film arrives June 23rd, 2017, the Amazon warrior princess may have been surpassed by another character as DC’s most popular leading lady. And incredibly enough, this character didn’t even first appear in a comic. It’s Harley Quinn, the beloved Paul Dini and Bruce Timm creation who arrived in Batman: The Animated Series. Since her arrival, Harley has become a cornerstone of DC’s comic line and an immensely popular character outside of it. But is she really a bigger draw than Wonder Woman these days? If so, why is that? And is she actually the new third member of DC’s Trinity? As with most things, the answer is “it’s complicated.” But let’s try and find an answer anyway. To try and suss out whether Harley Quinn has become the most popular woman at DC Comics, we’re going to look at an array of metrics from a variety of sources. The beauty of today’s digital era is if you want to quantify nearly anything, you can. That includes the popularity of comic characters. Let’s dig into five key categories one by one to see how Harley compares to Wonder Woman, as well as some of their peers. To be honest, both are in quite a few. If you’re just including books that are being published between now and April, Harley’s starred or is actively starring in seven books. That’s Harley Quinn, Harley Quinn and Power Girl, the bi-monthly Harley’s Little Black Book, New Suicide Squad, the upcoming Harley Quinn and Her Gang of Harleys, the one-shot Harley Quinn and the Suicide Squad April Fool’s Special, and she’s appeared in DC Comics Bombshells as well. Going outside of just titles, Harley even had her own variant cover month last February. Wonder Woman isn’t far behind, starring or appearing in five comics herself – Wonder Woman, Superman/Wonder Woman, The Legend of Wonder Woman, DC Comics Bombshells and Justice League. She’s no slouch, but Harley wins this one. When determining the popularity of any comic character, one of the first places you should always look is how their comic is selling. While Harley Quinn and Wonder Woman both actively have books in the market, they’re at much different points in their life cycles. Wonder Woman was featured in the initial launch of the New 52, and her title is at issue #47 as of December 2015’s sales charts. Meanwhile, Harley Quinn launched later. Her title’s only on issue #23, although the first issue was actually #0, not #1. So to provide a better point of comparison, I mapped out the orders – per Comichron – for both books throughout their entire current volumes. Every step of the way, Harley Quinn’s main title has outsold Wonder Woman’s. While the market itself has grown since Wonder Woman’s latest debut, that title launched during the salad days of DC’s most recent (and famous) relaunch. 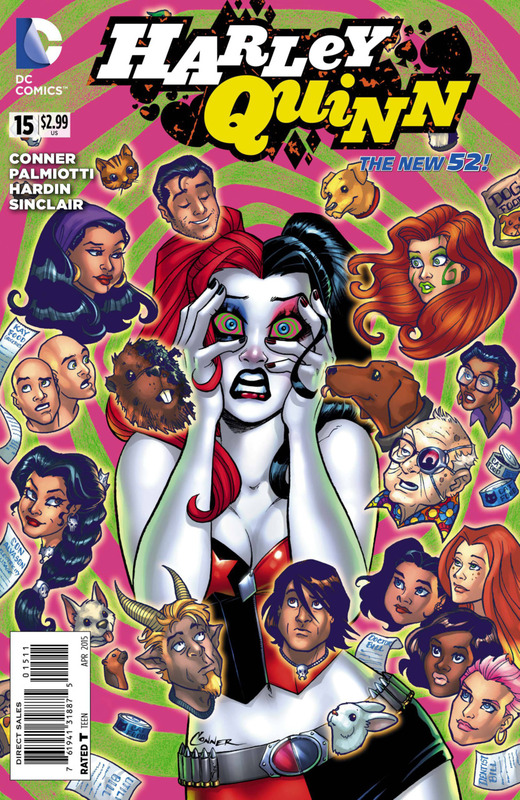 Harley Quinn, on the other hand, dropped in November of 2013 and was DC’s – and the whole industry’s – second highest selling issue that month. The disparity only grew from there, as Harley Quinn’s orders decreased progressively to issue #3, but since has stayed steady and even risen from that point. That’s rare for any kind of comic, but for a mainstream superhero book, it’s unheard of. It’s created a substantial gap between the two books. This past month, Harley Quinn had over 72% more copies of her title ordered than Wonder Woman. In shops, it’s an even greater difference. John Hendrick, the owner of Big Bang Comics in Dublin, Ireland, shared that his shop orders five times more Harley Quinn, and that doesn’t even include related variants and merchandise they’re stocking. Jen King, owner of Space Cadets Collection Collection in Oak Ridge North, Texas, revealed that in terms of actual sell-through to customers, they’re moving more than twice as much Harley Quinn as Wonder Woman. She cites the team of Amanda Conner and Jimmy Palmiotti as a big reason for that. However, she did note that she has high hopes that The Legend of Wonder Woman by Renae de Liz and Ray Dillon will perform better than the main Wonder Woman title. A third shop owner who preferred to remain anonymous also is betting big on that book. As of now, though, Harley Quinn is selling 160 to 175 copies per month against Wonder Woman’s 80 within their store. The retailer did note that Harley’s sales have been dropping lately, although they mentioned this as normal behavior for a title as it ages. One consideration to make: this doesn’t include digital sales, as those numbers are not disclosed by the outlets that sell them or the publishers that make them. Additionally, trade sales are not included. However, Harley’s top selling trade ranked #37 while Wonder Woman’s came in at #177 in 2015. That’s a substantial difference. All in all, though, the small cross-section of shops and overall orders in the direct market agree: Harley Quinn’s a hit. While it’s difficult to measure quality objectively, at least in today’s comic book industry, there’s a site we can turn to for a collective measurement of a title’s merits: Comic Book Round Up. This site aggregates reviews online in a way that’s not dissimilar from Rotten Tomatoes, except at this site, they measure average issue ratings rather than percentage of positive reviews. 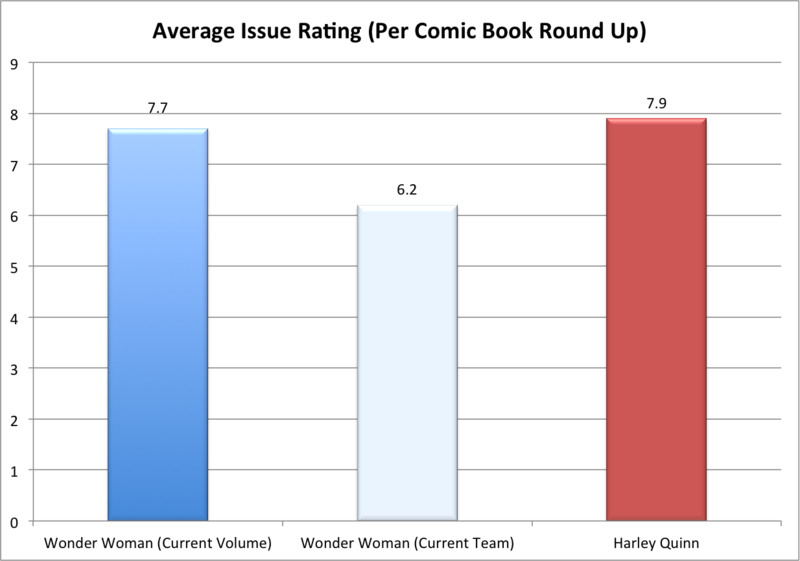 To determine the perceived quality of the book, a comparison was created between Wonder Woman’s current volume and Harley Quinn’s. In addition, a third measurement was added for an average of the current Wonder Woman team’s part of the run. Here’s what we found out (data as of 1/25/16). If you simply compared their most recent volumes, the two titles are close. Harley Quinn has a slight advantage, but it’s by no means significant. However, when you look at the recent run by Meredith and David Finch that started with issue #36, things get a bit darker. While Brian Azzarello, Cliff Chiang and Matt Wilson’s run on the book was well received, the Finches’ run has not been. Their issues have averaged a 6.2 rating from the varying sources. The most recent issue – #48 – generated their lowest grade yet at 3.5. Admittedly, that was based on only two reviews, but the point is this recent run has not been met well. Meanwhile, Conner, Palmiotti and regular series artist Chad Hardin have been churning out a book that has received generally good marks. At least in the minds of the comic reviewing community, Harley’s current book takes the cake. So Harley’s the leader when it comes to comic related metrics. Surely Wonder Woman still leads the way when it comes to the zeitgeist of today. While it’s hard to measure that without developing an actual, legitimate poll, we can look at a couple different sources. To start with, let’s answer a simple question: who is Googled more? Internet search is a key indicator when it comes to the heat behind a topic, and using Google’s Keyword Planner tool, a breakdown of the past year in search was created. 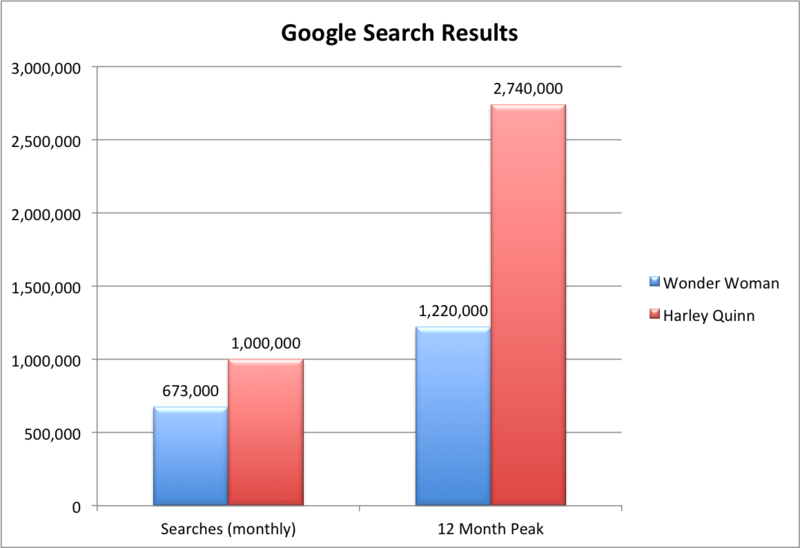 Both terms were searched as exact matches – only their names were measured, rather than the words included in their names – and Harley Quinn dominated in both 12 month average and peak search month. While that peak number skews the average towards Harley Quinn, overall, Harley Quinn had greater search totals in six of 12 months and was equal to Wonder Woman (per Google estimates) in two others. So it wasn’t just one outlier month working in Harley’s favor. You may wonder where that peak came from. That’s easy. The month was October, and Harley didn’t just lead in Google searches but also eBay searches, as she was the most popular costume this past Halloween. That’s a pretty big feather in her cap. Tracking sentiment on social media is a trickier task, but using Social Mention’s real-time search and analysis several times over a day period – January 25th of this year – I came up with an average. The results? Fairly dead even, really. Here’s a little clarification on those three metrics. 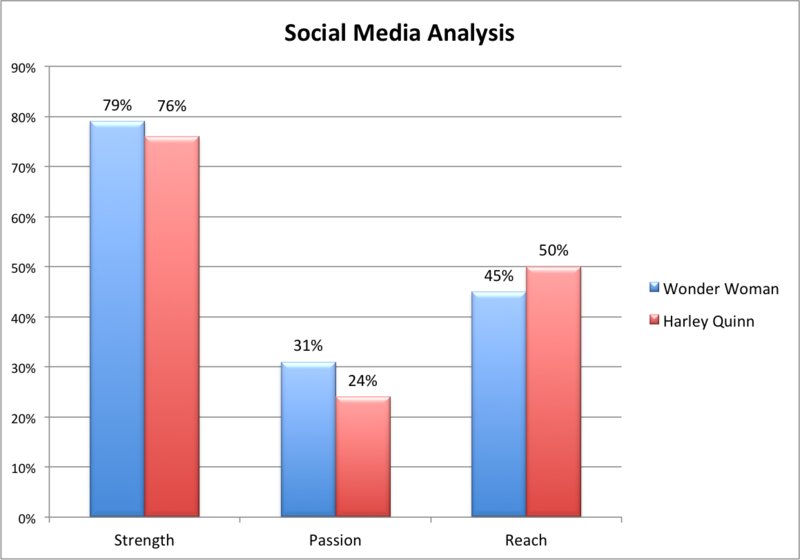 Strength measures the likelihood something is being talked about online, passion looks at the likelihood something will be talked about again, and reach tracks the how many of the people who are talking about a subject are unique rather than redundant. One that isn’t included on here, however, was sentiment. That’s the measure of positive comments versus negative. Harley’s ratio was six to one while Wonder Woman’s was two to one. That makes it two categories to two – a tie. It is worth noting that this tool has free flowing results, and with the amount of commentary being dropped on social, it’s difficult to determine a true winner in that regard. Combined with search, though, Harley ekes out a slight victory here. One important thing to note is that despite the comparison, Harley Quinn’s rise doesn’t mean that Wonder Woman has gotten less popular. With Gal Gadot soon to bring the character to the big screen, Grant Morrison and Yanick Paquette launching Wonder Woman: Earth One, and The Legend of Wonder Woman earning tons of praise (average of 8.7 on Comic Book Round Up! ), Diana’s on the verge of a big year. And Harley isn’t just outdistancing Wonder Woman these days – she’s surpassed almost every character at DC. 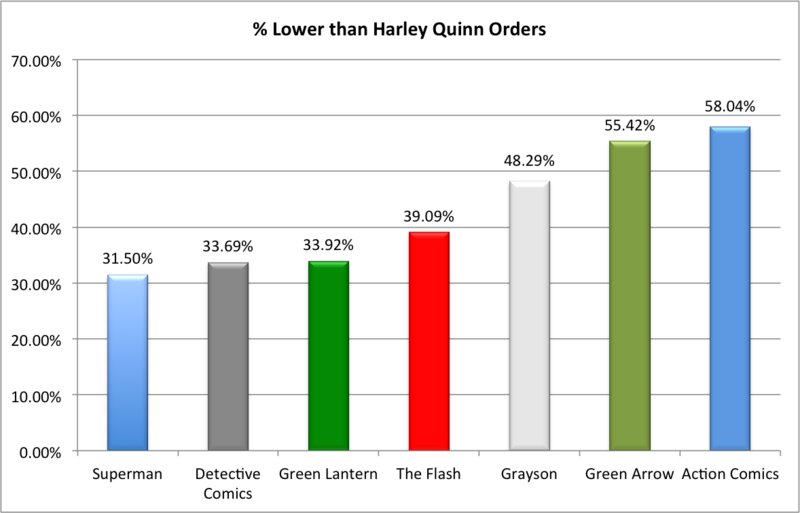 Look at this chart to see how far below Harley’s orders other top DC titles are. In terms of regular DC titles in December, Harley had the second and fifth highest selling books. Only Batman and Justice League broke up her reign. Other top DC titles didn’t just get outsold; they were crushed. 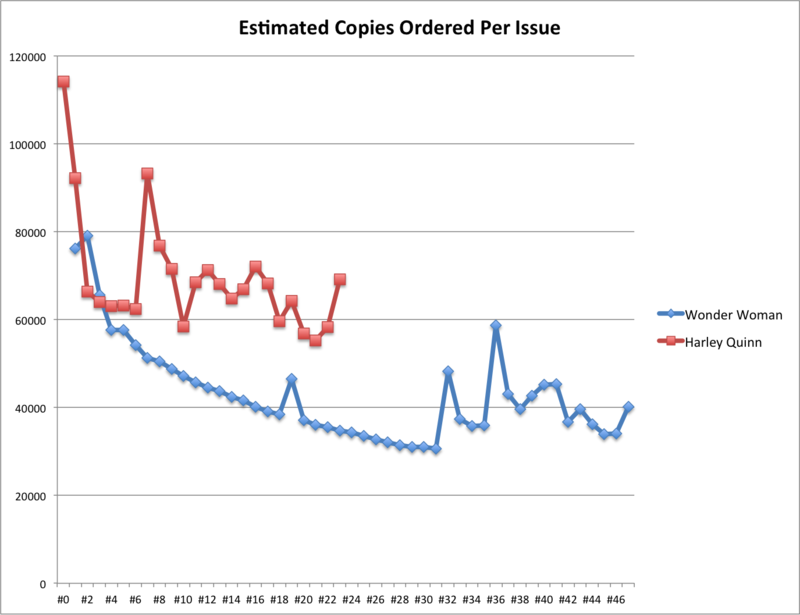 Action Comics – once upon a time the flagship book of the publisher – sold less than half of what Harley Quinn did. You could make an argument that Harley is DC’s second most popular character right now. That’s incredible. As you may have gathered, Harley Quinn’s pretty popular these days. And because of her ascendance, DC has responded in kind. That’s why it seems every month there’s a new Harley Quinn related announcement. They are riding the Harley train as long as they can. But why is she so popular? It’s difficult to pick one reason above the rest, as there are a bevy to choose from. Harley’s a much more humor-oriented character than other DC universe denizens. In an era of deathly serious comics, that’s a welcome characteristic. She’s an action comedy character with a free-flowing, ratatat style that matches our constantly plugged in nature. Conner and Palmiotti handle those elements well without making her a caricature. While she’s not as meta as her closest Marvel parallel, Deadpool, she seems more in on the joke than others. That plays well. Although not a defining characteristic, Harley’s more sexual than most, and she’s much more LGBT friendly as well. Her title recently earned a nomination from GLAAD for Outstanding Comic Book, even. You should never underrate the power of Batman: The Animated Series either. That series was immensely popular, and it’s more well known to and liked by today’s audiences than arguably anything DC’s released in mass media since its debut in 1992, besides Nolan’s Batman trilogy. Odds are, if you ask the average Harley fan what words you think of when you hear her name, it’d either be “Mistah J” or “Puddin’” in Arleen Sorkin’s unforgettable voice. Plus, this permanently associated Harley with two of DC’s most popular characters: Batman and The Joker. While those relationships aren’t the reason for her popularity, it helps. Lastly, Harley has an array of well-loved and infinitely cosplayable costumes. Her omnipresence on Halloween is a strong indicator of that, but if you go to any comic book convention, you’ll find Harley Quinns around every corner. That’s valuable. This level of visibility is both indicative of and a major contributing factor to her popularity. While her fame could be a passing phase like Gambit, Spawn or other titans before her, Harley’s feels more sustainable. Her first appearance was over 23 years ago, and she first came to the proper DC comic universe over 16 years ago. This isn’t new. At least not entirely. It just feels like the progression of something that’s been building for a long time. As of January 2016, for all intents and purposes, Harley Quinn is the most popular woman at DC Comics. While she’s not as well known as Wonder Woman is in a global scale; in terms of actionable popularity, it’s hard to argue that Harley isn’t DC’s leading lady. Everything we looked at today indicates that, and DC’s enamored with her in a way that means we’re only going to get more of her. With that said, let’s be realistic: Harley’s never going to become the third point of DC’s Trinity. While she’s tremendously popular, even her staunchest of proponents would admit that such a role makes little to no sense for her. DC could shoehorn her in – and I wouldn’t put it past them at this point – but in terms of character, it wouldn’t be a good fit. She’s an oddball; a counter-culture character who is beloved by many because she lives on the fringe. Could you imagine her playing a prominent role in the next DC Crisis? I couldn’t either. So in that regard, Wonder Woman’s hold at the top will stay strong. As it should. She’s too important to the fabric and balance of the DC Universe not to be. Beyond that, Wonder Woman is a character who inspires people. I have friends who adore her and have for their entire lives. A close friend of mine gave his daughter the middle name Diana in honor of the character. That’s the kind of power she has. She’s an icon, and one with a lasting impact. If anything, everything shared above shows two things: Harley Quinn is a sensation and DC has mishandled Wonder Woman as of late. It seems clear that Wonder Woman’s comic needs a fresh start, and one that better showcases the characteristics that make people love her. Given the affinity people have had for de Liz and Dillon’s The Legend of Wonder Woman, I’m hopeful DC considers them for the main title post Rebirth. Either way, the character could use the kind of attention on the comic side that she’s received on the movie side. Perhaps 2016 is the year where we see that happen. For now, though, Harley Quinn is DC’s shooting star, and we’re only going to see more of her in 2016. 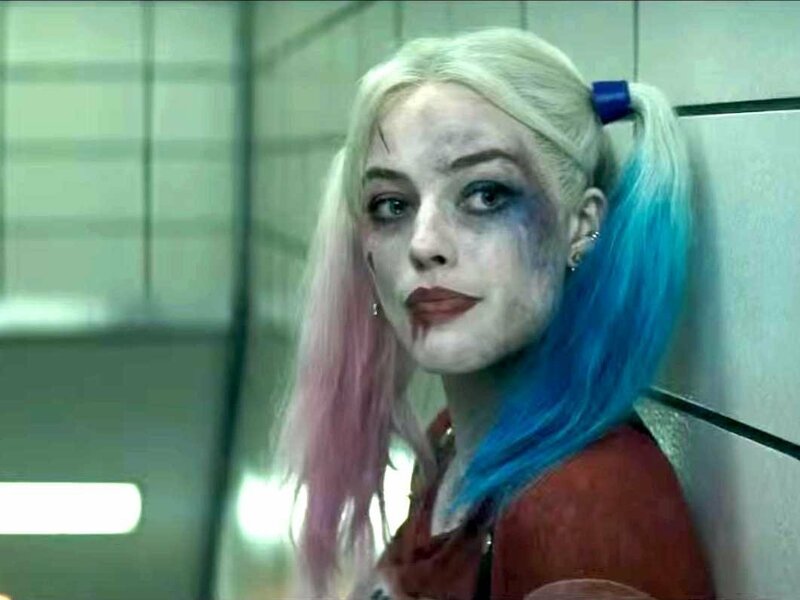 Near as anyone can tell, Margot Robbie’s going to light the world on fire in August’s Suicide Squad movie. When that happens, the sky’s the limit for the character, especially if the current creative team stays on. Trinity or no Trinity, Harley Quinn’s here to stay as one of the biggest names at DC Comics. 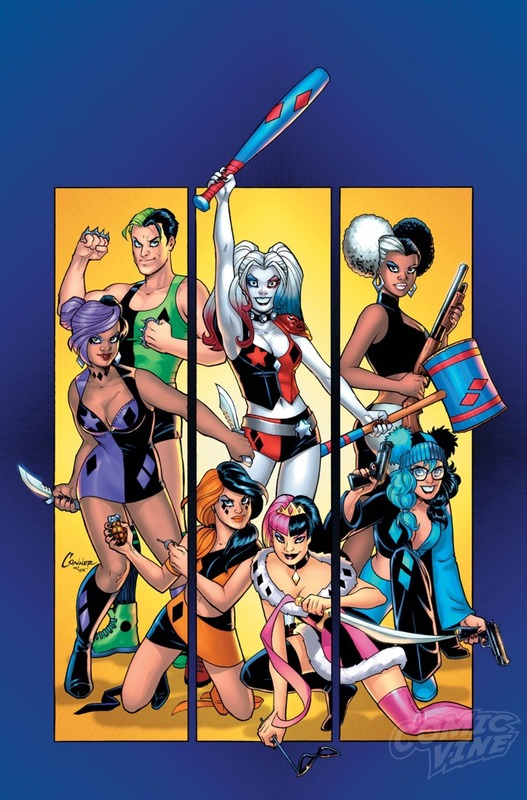 Header art from Harley Quinn #17 by Amanda Conner and Alex Sinclair. All data taken from Comichron, Google’s Keyword Planner tool, Social Mention and Comic Book Round Up as of January 25th and formatted for the article by myself. Thanks to John Hendrick, Jen King and the third retailer for the insight into what they’ve seen at their shop.